Bill and I drove about 30 miles east of Denver tonight into the ‘plains’ to get away from the light pollution for some deep-space photography. Here’s a couple of photos of the diffuse nebula in the constellation Orion. These were shot with a Meade ETX-125, t-adapter, and Nikon D100. 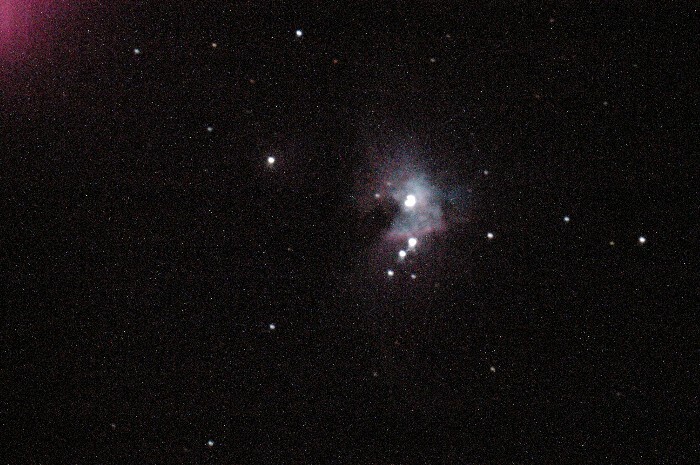 The object was tracked by the telescope’s motor drive unit while the camera exposed the CCD for 15s. The CCD was set to its highest sensitivity setting; HI-2 which is equivalent to 6400 ISO. Bill, any idea whether this is M42, a subset or maybe the fainter M78, or? 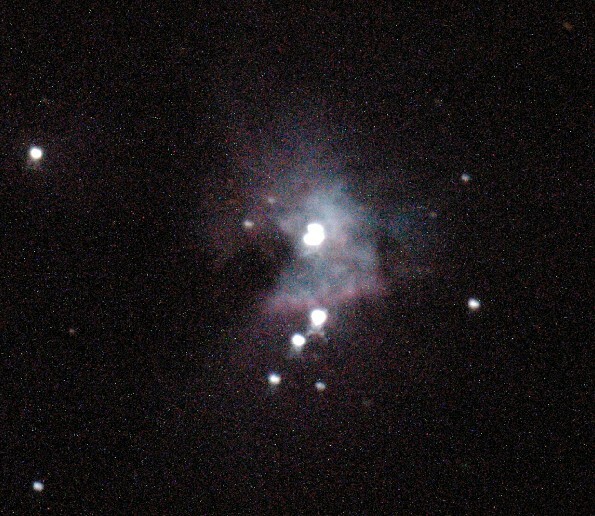 Confirmed this is M42 (Orion Nebula). We are zoomed in way too far to see the whole Nebula, even on the lowest mag image here. The images are centered on the brightest portion of the Nebula which turns out to be the least interesting – kind of looks like the center of a jellyfish, but the tentacles are more interesting, as is its northern predator (the smallish colored area that the jellyfish is chasing, which is off the photo taken here, but still part of the Nebula). I doubt we are seeing M78 anywhere in this photo. It is found by “sweeping the area”, and since we are so far zoomed in, there are no wide views available. 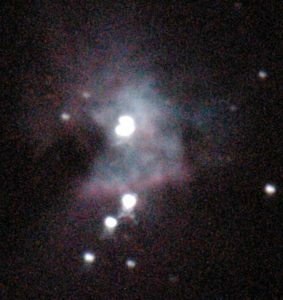 Interesting: “Even a short time exposure with a tripod-mounte d 35 mm camera, using an ordinary 50 mm or 35 mm lens, shows the nebula as red and allows the principal stars in Orion to be picked out.” From Peterson FIeld Guied “Stars and Planets”.